At age 17, Charles made the decision to serve his country. The U.S. had just declared war with Japan, and he wanted to play his part. When the recruiter found out that Charles was ambidextrous, he told Charles that this skill would be very useful in the navy. Charles couldn't help but recall all the times he had been scolded as a child for writing with his left hand. The sting of the ruler and the welts it left behind were still fresh in his memory, even though years had passed since the last time he had been reprimanded in class. Charles’s unique skill earned him a spot as a weatherman — a position that would require constant writing, often in adverse conditions. On the USS Richmond, Charles learned the ropes of deciphering codes from submarines and other ships to provide an accurate forecast to his commanding officer. After his training, Charles was released to perform his duty as the lone weather officer on board the USS Richmond. Even on board a ship full of sailors, Charles felt isolated. His position afforded him his own office — a perk that caused many others to look down on the teenage weatherman. In his first combat experience, Charles was below deck when an explosion forced his body into a wall, knocking out six of his teeth and nearly causing him to lose consciousness. Charles recalled that he didn’t feel fear in that moment; he had a job to do and snapped into gear, clearing debris, assisting wounded sailors, and helping put out fires. But his self-confidence and isolation would soon land him in a position that would nearly cost him his life. During a massive tropical storm, Charles stood on the deck as the rain and wind whipped around him. He had spent so much time by himself on his ship that he didn’t think twice about being alone. The ship rocked under the force of the waves, causing Charles to sway back and forth as he tried to navigate back below deck. An unexpected wave knocked Charles off his feet and swept his body rapidly toward the edge of the ship. In a moment of panic, Charles cried out to God in the wind and darkness. His body slipped over the edge, but his hand somehow caught a cable that kept his body from sliding into the dark waves. Charles held on for dear life and prayed. Even in the howling wind and pounding rain, Charles felt God’s voice speaking to him. He told Charles that he would be spared, and he wanted Charles to stay with him as he journeyed through life. That moment was a turning point for Charles. Tears well up in his eyes as he recalls the many times that he faced death in the months that followed. He trained weather officers on the USS Hornet, only to watch that ship sink in combat one day after he had left the ship. His last memory of being with those sailors was taking Communion with them. He watched way too many sailors that he knew lose their lives throughout the war. Bombs exploding near him sent shrapnel into his face. But through it all, Charles felt the presence of God reassuring him as he prayed for his fellow sailors and kept doing his duty. 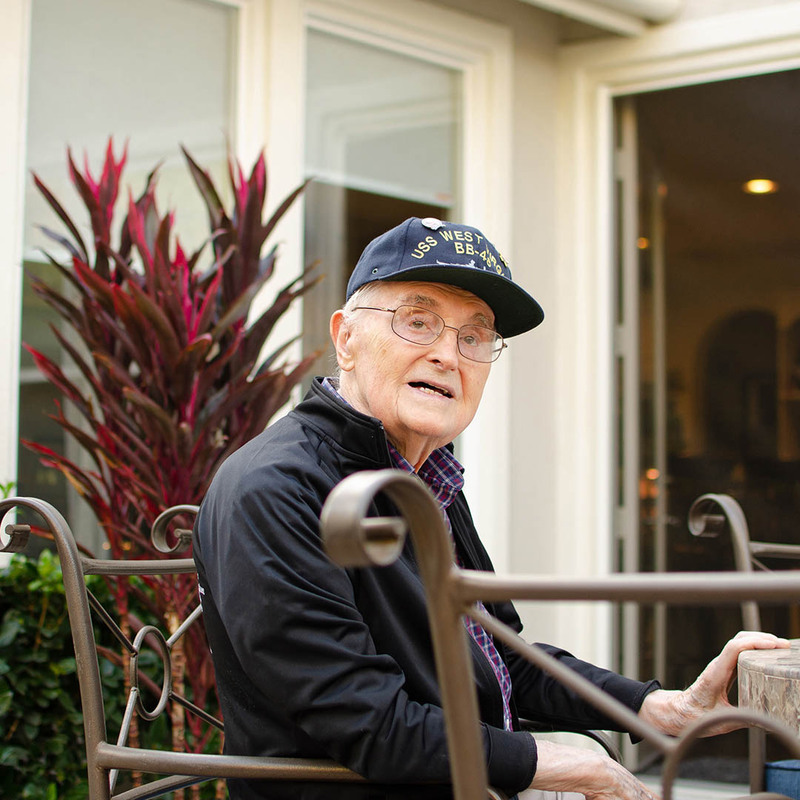 At the end of World War II, Charles joined the naval reserves for the next 11 years of life while he started a family and had three sons of his own. Though his first marriage ended, in his 40s he remarried to Nancy, a woman who had a son and a daughter. His stepdaughter Michele recalls that her “pop,” Charles, always made every one of them feel loved and cared for. He often went above and beyond to provide for and help their family. Even after he retired, Charles and Nancy helped Michele and her kids in tremendous ways. And it was through Michele that Charles and Nancy heard about a growing church in Lake Forest and were invited to join them one Sunday for a service in a tent. Charles and Nancy had just moved to south Orange Country from Cerritos and had left the church they had spent several years attending there. From that weekend, the couple made Saddleback Church their home, first at the Lake Forest campus, then later at the Laguna Woods campus. Even in the retirement stage of life, Charles and his wife found a community at Saddleback Laguna Woods they could belong to and thrive in. And it was from this place of stability that Charles and Nancy were able to care for and show love toward others. When family members were in the middle of a health crisis, Charles was there to care for them and walk with them through it. Even into his late 80s, Charles was not above doing whatever it took to make sure the people in his life were cared for. In 2015, after Charles had been married for 47 years, an aggressive form of dementia led to the sudden passing of Nancy, leaving Charles alone in hospice care with his own deteriorating health. He needed assistance and supervision all day, and to his family, it didn’t seem like he had much longer to live. His family began to prepare for the worst. At Saddleback one weekend, Michele was sharing her struggles with a friend. Her friend happened to know of someone who provided one-on-one care for patients and was looking for a placement. Michele thought this was perfect. She brought Charles home and organized for everything to be taken care of. At the very least, she knew, he would be close to family for the last part of his life. At home with family, Charles’s health began to rapidly improve. He regained his mobility, energy, and some of the lost independence that his health problems had taken from him. With a renewed energy and persistent hope that God remains with him in his life, Charles began sharing his journey of faith as often as possible. He knows the encouragement and hope that God has used to carry him through some of the most difficult moments of life will encourage others. At 93, Charles sees the difference he can still make in others’ lives and the good he can still do for the church. Ultimately, his goal is to encourage people who are disconnected from God to find that life-giving relationship with him and a healthy local church to be part of.